The laptop compartment features anti-collision isolation pad to house fragile items and electronic devices such as laptops, cameras, and lenses, and that double-zipper large opening allows for easy packing and unpacking. The front compartment includes loops to organize your keys and pens, while four front pouches provide spacious room for mouse, cell phone, charging cable, calculator, and more. For added comfort, the case designed with a ergonomic shoulder strap with breathable honeycomb pad to relieve pressure. Loops on both side pockets to provide extra room for hanging sunglasses, hats, tennis rackets, and more. 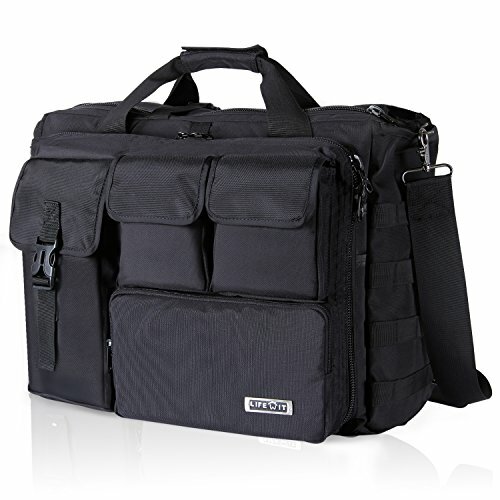 The bag is suitable for a wide variety of applications, such as school bag, office bag, messenger bag and tactical bag. Please allow for minor errors due to manual measurement. There might be slight color deviation due to different display.